Not to be confused with Kashmir. Cashmere wool, usually simply known as cashmere, is a fiber obtained from cashmere goats or pashmina goats and other types of goat. The word cashmere is an old spelling of Kashmir. Cashmere wool fiber for clothing and other textile articles is obtained from the neck region of Cashmere and other goats. Historically, fine-haired Cashmere goats have been called Capra hircus laniger, as if they were a subspecies of the domestic goat Capra hircus. However, they are now more commonly considered part of the domestic goat subspecies Capra aegagrus hircus. Cashmere goats produce a double fleece that consists of a fine, soft undercoat or underdown of hair mingled with a straighter and much coarser outer coating of hair called guard hair. For the fine underdown to be sold and processed further, it must be de-haired. De-hairing is a mechanical process that separates the coarse hairs from the fine hair. After de-hairing, the resulting "cashmere" is ready to be dyed and converted into textile yarn, fabrics and garments. Cashmere wool is collected during the spring moulting season when the goats naturally shed their winter coat. In the Northern Hemisphere, the goats moult as early as March and as late as May. China has become the largest producer of raw cashmere, estimated at 19,200metric tons (in hair) per year(2016). Mongolia follows with 8,900 tons (in hair) as of 2016, while Afghanistan, Iran, Turkey, Kyrgyzstan and other Central Asian republics produce lesser amounts. The annual world clip is estimated to be between 15,000 and 20,000 tons (13,605 and 18,140 tonnes) (in hair). Pure cashmere, resulting from removing animal grease, dirt and coarse hairs from the fleece, is estimated at about 6,500 tons (5,895 tonnes). Ultra-fine Cashmere or Pashmina is still produced by communities in Kashmir but its rarity and high price, along with political instability in the region, make it very hard to source and to regulate quality. It is estimated that on average yearly production per goat is 150 grams (0.33 lb). Pure cashmere can be dyed and spun into yarns and knitted into jumpers (sweaters), hats, gloves, socks and other clothing, or woven into fabrics then cut and assembled into garments such as outer coats, jackets, trousers (pants), pajamas, scarves, blankets, and other items. Fabric and garment producers in Scotland, Italy, and Japan have long been known as market leaders. In the United States, the town of Uxbridge, Massachusetts, was an incubator for the cashmere wool industry. It had the first power looms for woolens and the first manufacture of "satinets". Capron Mill had the first power looms, in 1820. It burned on July 21, 2007, in the Bernat Mill fire. Recycled – fibers reclaimed from scraps or fabrics that were previously woven or felted, and may or may not have been previously used by the consumer from various parts of the world. 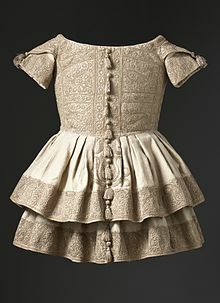 A boy's frock produced circa 1855 in Kashmir; cashmere wool twill with silk embroidery and silk tassels. Cashmere has been manufactured in Mongolia, Nepal and Kashmir for thousands of years. The fiber is also known as pashm (Persian for wool) or pashmina (Persian/Urdu word derived from Pashm) for its use in the handmade shawls of Kashmir. References to woolen shawls appear in texts surviving from between the 3rd century BC and the 11th century AD. However, a popular notion in Kashmir is that it was the 15th-century ruler of Kashmir, Zain-ul-Abidin, who founded the local wool industry by bringing weavers from Turkestan. Another local tradition sees the founder of all Kashmiri crafts in the famous 14th century saint Mir Sayyid Ali Hamadani who, tradition goes, brought 700 craftsmen from Persia to Kashmir. When Ali Hamadani visited Ladakh he discovered for the first time in history the warmth and fineness of ladakhi goat wool. He combed some goat wool and made a pair of socks with his own hands. Afterwards he gifted those socks to the king of Kashmir, Sultan Qutubdin (1374-89 AD). Sultan was amazed by their durability and fineness. 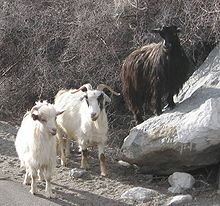 Ali Hamadani brought some raw goat wool from Ladakh and suggested the king to start shawl weaving in Kashmir. That was the starting point of the usage of the cashmere wool. Trading in commercial quantities of raw cashmere between Asia and Europe began with Valerie Audresset SA, Louviers, France, claiming to be the first European company to commercially spin cashmere. The down was imported from Tibet through Kazan, the capital of the Russian province of Volga, and was used in France to create imitation woven shawls. Unlike the Kashmir shawls, the French shawls had a different pattern on each side. The imported cashmere was spread out on large sieves and beaten with sticks to open the fibers and clear away the dirt. 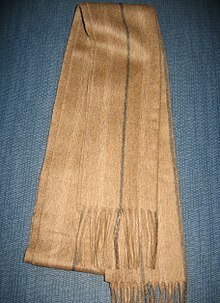 After opening, the cashmere was washed and children removed the coarse hair. The down was then carded and combed using the same methods used for worsted spinning. In the 18th and early 19th centuries, kashmire (then called cashmere by the British) had a thriving industry producing shawls from goat down imported from Tibet and Tartary through Ladakh. The down trade was controlled by treaties signed as a result of previous wars The Shawls were introduced into western Europe when the General in Chief of the French campaign in Egypt (1799-1802) sent one to Paris. The shawl's arrival is said to have created an immediate sensation and plans were put in place to start manufacturing the product in France. In 1799 at his factory in Reims, William-Louis Ternaux, the leading woolens manufacturer in France under Napoleon, began to produce imitation India shawls (cachemires) using the wool of Spanish merino sheep. By 1811, with government assistance, Ternaux also began experimenting with the production of real India shawls using what he called laine de Perse, i.e., the down (duvet) of Tibetan-cashmere goats. In 1818, Ternaux resolved to help establish herds of cashmere goats in France. A famous expedition to Persia was organized, led by the orientalist and diplomat Pierre Amédée Jaubert, to be financed in part by the French government. Of the acquired herd of 1,500 animals, only 256 arrived safely in the spring of 1819 at Marseilles and Toulon via the Crimea. About 100 of the cashmere goats were then purchased by the French government (at 2,000 francs each) and sent to the royal sheep farm at Perpignan. The remainder, about 180 including new-borns, went to Ternaux's property at Saint-Ouen outside Paris. Although Ternaux had little success getting small farmers to add cashmeres to their sheep herds, a few wealthy landowners were willing to experiment with the goats. For example, Ternaux’s herd was seen in 1823 by C.T.Tower of Weald Hall, Essex, England. Tower purchased two female and two male goats and took them back to England, where in 1828 he was awarded a gold medal by the Society for the Encouragement of Arts, Manufactures and Commerce for rearing a herd of cashmeres. Also, a few of Ternaux's goats were purchased for a model farm at Grignon, near Versailles, run by M. Polonceau. Polonceau crossbred the cashmeres with Angora goats to improve the down for spinning and weaving. This Cashmere-Angora herd was seen by William Riley of New South Wales in 1828, and again in 1831 when Riley purchased thirteen of the goats for trans-shipment to Australia. At the time, the average production of the Polonceau herd was 16 ounces (500 grams) of down. Ternaux's herd at St. Ouen still numbered 150 when the famous industrialist died in 1833. The herd at Perpignan died out by 1829. By 1830, weaving cashmere shawls with French-produced yarn had become an important Scottish industry. The Scottish Board of Trustees for the Encouragement of Arts and Manufactures offered a 300 pound sterling reward to the first person who could spin cashmere in Scotland based on the French system. Captain Charles Stuart Cochrane collected the required information while in Paris and received a Scottish patent for the process in 1831. In the autumn of 1831, he sold the patent to Henry Houldsworth and sons of Glasgow. In 1832 Henry Houldsworth and sons commenced the manufacture of yarn, and in 1833 received the reward. Dawson International claim to have invented the first commercial dehairing machine in 1890, and from 1906 they purchased cashmere from China, but were restricted to purchasing fiber from Beijing and Tianjin until 1978. In 1978 trade was liberalised and Dawson International began buying cashmere from many provinces. Many early textile centers developed as part of the American Industrial Revolution. Among them, the Blackstone Valley became a major contributor to the American Industrial Revolution. The town of Uxbridge, Massachusetts became an early textile center in the Blackstone Valley, which was known for the manufacture of cashmere wool and satinets. Austrian Textile Manufacturer Bernhard Altmann is credited with bringing cashmere to the United States of America on a mass scale beginning in 1947. 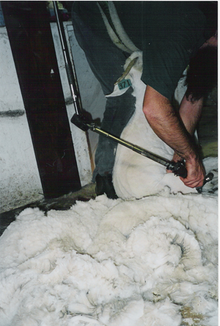 ^ "Wool Products Labeling Act of 1939 (15 U.S.C. § 68)". Federal Trade Commission. Retrieved 13 January 2009. ^ "Kashmir Pashmina origin and introduction of its trade". kashmirshawls.in. Retrieved 2019-01-09. ^ Toigonbaev, Sabyr (18 March 2015). "The finer, the better". D+C Development and Cooperation. 42 (4). Retrieved 9 June 2015. ^ a b Zutshi, Chitralekha (2014). Kashmir’s Contested Pasts: Narratives, Geographies, and the Historical Imagination. Oxford University Press. ISBN 0199089361. ^ Rafiabadi, Hamid Naseem (2005). Saints and Saviours of Islam. Sarup & Sons. ISBN 8176255556. ^ a b McGregor, Bruce Allan (2002). "Australian Cashmere Attributes and Processing" (PDF). Rural Industries Research and Development Corporation: 10. ^ George Ripley and Charles A. Dana, ed. (1861). "Cashmere". The New American Cyclopedia. IV. New York: D. Appleton & Company. p. 514. Retrieved August 17, 2010. ^ Newton, W. (1836). The London Journal of Arts and Sciences and Repertory of Arts And Sciences and Repertory of Patent Inventions. p.423. ^ Gilroy, Clinton G. (1844). The Art of Weaving, by Hand and by Power, With an Introductory Account of Its Rise and Progress in Ancient and Modern Times. New York: George D. Baldwin. pp. 270-71. ^ Bell, James (1829). A System of Geography Popular and Scientific or a Physical, Political and Statistical Account of the World and Its Various Divisions. London. ^ "Cashmere", The New American Cyclopedia, IV (1861), p.514. ^ Ternaux, William (1819). "Notice sur l'importation en France des chèvres à laine de cachemire, originaires du Thibet", Bulletin de la société pour l'industrie, XVIII. ^ Ternaux, William (1822). Recueil des pièces sur l'importation et naturalisation en France par MM. Ternaux et Jaubert des chèvres de race thibetaine, ou chèvres à duvet de Cachemire. Paris. ^ Southey, Thomas (1851). The Rise, Progress and Present State of Colonial Sheep & Wools. London: Effingham Wilson. ^ "Cashmere Shawls, Part II", Saturday Magazine, Vol 19 (London 1841), 13-14. ^ The Ministers of the respective parishes (1854). The New Statistical Account of Scotland, Volume VI. Edinburgh and London: William Blackwood & sons. p. 168. ^ "Vintage Fashion Guild : Label Resource : Altmann, Bernhard". vintagefashionguild.org. Wikimedia Commons has media related to Cashmere wool. This page was last edited on 8 April 2019, at 10:11 (UTC).